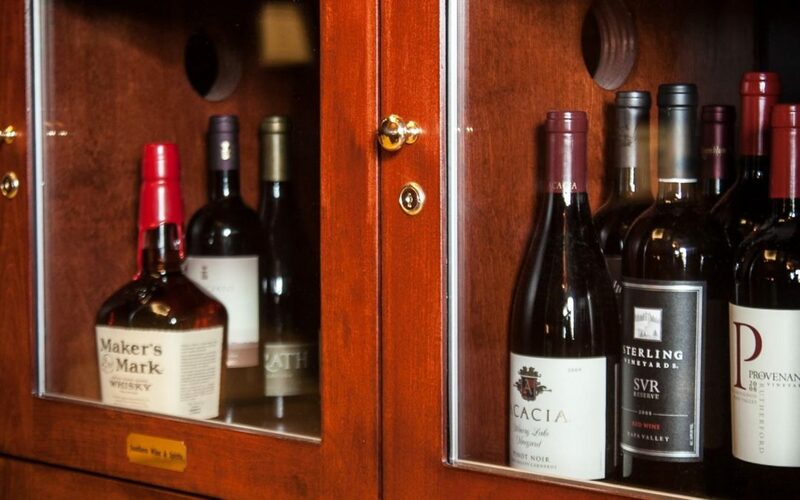 How to Properly Store Wine | Christner's Prime Steak & Lobster..
It’s no secret that wine gets better with age. However, this is only true when the wine is properly stored. Considering how long it takes for some wines to mature, seemingly small factors can have a huge impact on the taste and smell of the wine when you actually go to enjoy it. With that in mind, let’s discuss some best practices for storing wine. Infographic created by Wine Folly. It’s best to keep your wine in a dark room as too much light can negatively affect the bottle and cause an odor. This is caused by the UV rays breaking down the chemicals in the wine too rapidly, essentially causing it to age prematurely. Natural sunlight is the main cause of this, but virtually every light has some number of UV rays, so the darker the room, the better. Darker bottles and wines aren’t as prone to this, but, over a long enough period of time, they will still be affected. So, whenever possible, store your wine in a dark closet or basement where a lot of light won’t be able to hit the wine. The temperature of wines being served is a commonly discussed topic, but what about when they’re stored? Well, the ideal temperature is in the range of 60 degrees F. Anything below 55 or above 70 is too cold and too hot, causing negative consequences and poor flavor when opened. Never store your wine for the long-term in your kitchen refrigerator. It’s much too cold. Also, find a spot that has a constant temperature. Wine responds well to being kept still and at the same temperature throughout the aging process. Humidity also plays a part, but mainly when the wine is being stored for very long periods of time. Traditionally, a room with humidity of about 70% is ideal. Wine bottles with traditional, authentic corks (not synthetic corks or screw tops) need always be stored sideways for the long term. When stored upright, the cork dries out and shrivels up, causing particles to fall into the wine and creating holes for oxygen to get into the bottle. However, storing the bottle sideways allows for the wine to be in contact with the bottom of the cork and prevents it from ever drying out enough to cause these issues. It’s never a good idea to move around your wine when it’s in storage. Even small, minute vibrations can cause problems. There are two different ideas when it comes to why the movement of wine is harmful. One camp believes that it has to do with the sediment while the other argues for a chemical reaction. Sediment is a residue that settles at the bottom of the bottle while wine ages. When moved, however, the sediment mixes with the liquid and causes a different, not-as-pleasant flavor. If this is happening many times over years of storage, it can ruin a wine. The chemical reaction comes down to an increase in refractive index, propanol, and isoamyl alcohol and a decrease in tartaric acid, esters, and succinic acid. These changes cause the wine to age too quickly, resulting in a less aromatic nature and an often far-too-sweet flavor. So, make sure that all of your wine is readily available and easy-to-reach. You don’t want bottle behind other bottles either because you’ll have to move the one in front if you’re craving the one in the back. Also, don’t store your wine on the top of your refrigerator. This practice is very common and it may look nice, but your fridge is constantly moving and vibrating from the cooling system and the door opening and closing. If you choose to store your wine in a closet or other enclosed room in your home, make sure that there isn’t anything else stored that with a strong smell. These odors can leak into the wine through the cork and completely taint it. Ensuring that the storage room has good ventilation is a good idea to prevent this from happening. If you don’t have a cellar to professionally store your wine, you could also consider a wine cooler for your home. There are plenty to choose from on Amazon, fitting anywhere from six to fifty bottles. Once you’ve already opened your wine, you can store it for a couple of days before it starts to lose its flavor. For white wines, recork it and place it sideways in your kitchen refrigerator. Red wines can be left upright and at room temperature, but should also be recorked. To recork your wine, you can simply reuse the cork that it came with or use one of the many wine stoppers available online. One unique wine preserver that we’ve seen is the Air Cork. If you’re wanting to store your bottle for years, it’s an investment. For the best results, you should look into storing it in a professional storing environment. If you’d like to rent one of our professionally maintained, temperature-controlled wine lockers, email us at info@christnersprimesteakandlobster.com.